Five Spice Tofu with eggs originates in China, and was introduced by the Chinese to the local cuisine. It's been adapted to fit the taste here by adding a lot of peppercorns and palm sugar. This menu is famous in Thailand which is basic recipe of Thai people, You can eat them in all curry rice shop in Thailand. Product of Thailand (Ship from Thailand). 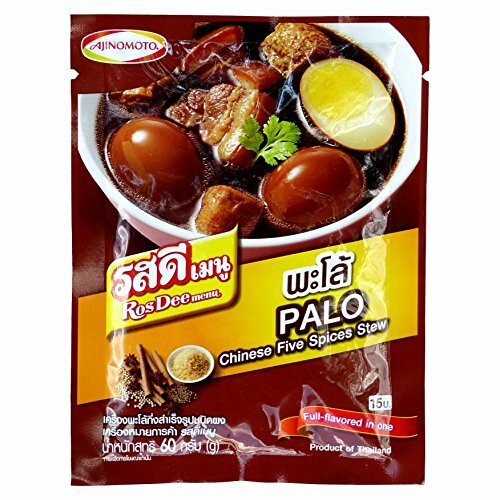 Manufacturer: Ajinomoto (Thailand) Ltd. Bangkok Thailand. Publisher: Ajinomoto (Thailand) Ltd. Bangkok Thailand. Studio: Ajinomoto (Thailand) Ltd. Bangkok Thailand.